I've decided to start a new series of recipe reviews. Each month I'll pick a recipe that has been posted online on a blog, website, newspaper or somewhere else. It might be a recipe that intrigues me, an unusual process, something that I can't imagine the texture or flavour of or just something that I really want to eat. I'll make it, photograph the process, honestly tell you what I think and link to the recipe. To start, I have a Pinterest board filled with recipes I'd like to try. If there's one you're particularly interested in, like it on the board and I'll take it into account. I'd also love to hear if you have any new suggestions - if you could leave a note with a link in the comments or send me an email that would be wonderful. So, for July: Polenta and Elderflower Cookies by Emiko Davies. This recipe easily covers the 'intrigued', 'unusual process' and 'can't imagine the texture or flavour' categories. Emiko is one of my favourite bloggers. She lived in Florence for many years before moving to Melbourne with her Italian husband and baby daughter. This recipe comes from Artusi's 1891 cookbook, Science in the Kitchen and the Art of Eating Well, a source of many of Emiko's recipes. I always learn something from her posts - without fail, they're both beautiful and intelligent. Every year, I make my family's elderflower cordial recipe (the photo above is of this year's batch). It's one of my favourite drinks and a ritual I look forward to. Before I read Emiko's post, I didn't know you could cook with dried elderflower - I'd only heard of cordials, syrups, wines and other drinks. 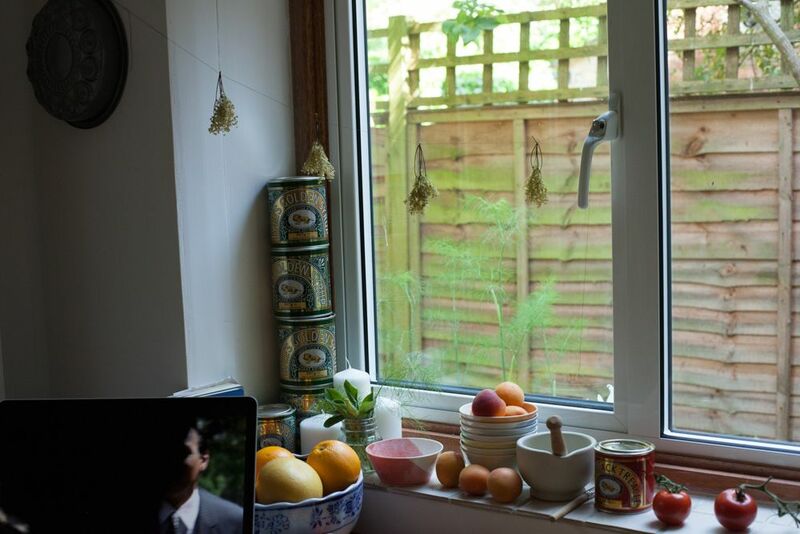 In the comments, we had a chat about how to get dried elderflower - Emiko bought hers as high-quality tea but I was wondering if I could dry my own. So, when I went out to collect the flowers for my cordial, I picked a few extra to dry (the same rules apply - make sure it's from a secluded spot away from traffic with healthy, creamy-white flowers). I used a needle and thread to string them up by the stem between the handle of my window and a nail in the wall that I hang a lovely Dutch cake tin on (here's another photo). After a few days they seemed to have dried out - in the end, I left them for a week. Once I'd taken them down, I gently stripped the flowers off the stalks with my fingers. It was a bit of a pain - the dried stalks snap easily and fall into the bowl - but in the end I had heap of flowers in the bottom with a film of pollen coating the china. The recipe is simple - you cream the butter and sugar, add an egg yolk, then stir in the polenta and elderflower. The dough is then rolled out, cut and baked until golden. The mixture is easy to work with - as it has no gluten, you can reshape and roll without worrying. The final texture is, for lack of a better word, gritty - but that's surprisingly pleasant, in a crunchy sort of way. I think if I make them again I might use a mix of polenta and flour, to balance out but still maintain the crunch. I thought they tasted best straight out of the oven. The flavour of the elderflower is distinctive and recognisable from the cordials but slightly dustier and, well, dried. It reminds me of the difference in smell and taste between fresh and dried herbs. I ate one with a cup of Earl Grey and the elderflower really pulled out the bergamot flavour, which I don't normally notice. 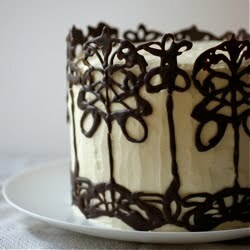 In conclusion: a fun experiment, an unusual texture and a new way of using elderflower. - I halved the recipe as I only dried four heads of elderflower. I'm not sure exactly how much the dried elderflower weighed but I had a small handful overall and I used it all. I made eleven cookies from the dough. - I used precotta instantanea polenta, as that was finer than the bramata, which was the only other type I could find. I had to go to an Italian deli - I couldn't find it in the supermarket except as a ready-cooked slab. - I used icing sugar and unsalted butter (I was going to add a pinch of salt but forgot). I didn't need to add water. - My butter was a bit warm as it was a hot day so I chilled my dough for 15 minutes to cool it down before I rolled it out. - They took 10 minutes to cook. What a fantastic idea for a series of blog posts! These cookies do sound quite intriguing, though I'm not sure I'd be jumping to try them out myself (it's the elderflower, I'm not a fan of floral flavors). How interesting that they use all cornmeal for the flour. Looking forward to the next post in this series! Well now I'm blushing! Thanks Emma for your kind words, feel so honoured to be the first in what sounds like a very interesting series - looking forward to following up the others! I also thought like you did that I'd try this another time with half flour, though first I plan to try with differently ground polentas to find the right one! At times I do crave a crunchy cookie and these are good for that! I love that you dried your own elderflowers for this recipe, a little bit more effort but I'm sure the result was lovely, perhaps even a bit more delicate? Thanks again Emma, for such a lovely post! This is a great blog series idea, I'll be really interested to see what recipes you try. I love elderflower cordial, I've never picked the flower but would be keen to have a go at these. I hadn't thought of the sweetness it brings - that's a good point. I'm looking forward to experimenting with it - what are your favourite ways to use it? I'm glad you like the idea - I have so many recipes I'd like to try and it's nice to sometimes faithfully follow a recipe and not adapt it - I think you can learn a lot. I totally get the floral flavours thing - I'm not a big lavender-in-food fan. Thanks Kiran, I'm really enjoying it so far. I'm not sure where you're based but in the UK the season is coming to an end, so make sure you get out soon if you want some. You deserve the praise! I'm pleased you approve. Do tell me how it goes with the other polentas and any flour mixes. Not sure if it was more delicate from being done at home - perhaps even stronger as it's fresh? No idea! I'm glad you like it - I'm looking forward to writing them. Do give cordial a go - it's so satisfying and knocks the normal stuff out of the water (though I do happily drink it most of the rest of the year). I'm so pleased you like the blog and recipes, Adelina - if I am ever in Amsterdam I will definitely contact you. I love the idea of tea from your parents tree - maybe another time you can try making cordial or baking with the tea. I love the new series! I appreciate the connection to the historical cookbook in this post. I'm now inspired to go dig through some of my older recipe sources and review some of my gardening books. Elderflower is not something one in the United States sees even rarely and I have never tasted but I may have to be content with ordering some syrup to experience the flavor. Excited for the next post. I love everything elderflower and these look so wonderful! Just wish I had access to an elderflower tree! And what a great idea for a series of posts! Looking forward to it! What lovely cookies, I love Emiko's blog, her photography and recipes are amazing. Love the use of polenta, and the elderflower of course. I have to read this recipe and see if I can use elderflower syrup which I have on hand. No dried elderflowers. I absolutely love the sound of these cookies - mentally bookmarked them when I came across Emiko's original post (I finally also put Artusi's book on my birthday wish-list). Alas I fear it may already be too late to pick fresh elderflower where I am. Emiko's post also inspired me to use polenta when I bake and having tried a few different recipes with polenta now I am not surer why I waited so long! Great idea for your new series and it put a smile on my face to see my white chocolate fennel truffles on your pinterest board (together with so many mouthwatering dishes!). These cookies sound really lovely and I'm really looking forward to seeing this new series of yours. I use polenta in cakes fairly often but have never used it in anything else sweet but I'm really interested to try now. What are your favourite cookies with herbs? I love keeping recipes there. It can be a bit overwhelming, as you say - but that's partly why I want to do this series, to try and actually make some of them! I'm so pleased you like the series. Sounds like an interesting search - do tell me if you dig anything up. It's been a really big elderflower season this year - it feels like it's everywhere. I'm sure you can buy some cordial online. Are you in the UK? There's a lot of elderflower about this year - I seem to see it everywhere these days! Glad you like the series. Emiko's very talented, isn't she. I'm not sure cordial or syrup would work, sadly, but I'd love to be proved wrong. I imagine yours will be over, yes - ours nearly is and we're a lot further north. Next year! What other recipes have you tried with polenta? I need to try some polenta cakes - I've used semolina before but not polenta. Glad you like the series idea. The background stack of golden syrup in that extra photo is brilliant! Do you really use that much of it? I do consider a store cupboard staple but I don't tend to go through it very quickly. Heheh they're empty - I've been collecting them for five years or so! I made some mini cornmeal and olive oil cakes a while ago. More recently I made the cornmeal pancakes from the Sprouted Kitchen cookbook (served with a cherry compote this made a perfect breakfast the other day). I have also made some saffron polenta shortbread cookies which I loved and replaced some flour with polenta in a peach and pine nut cake using a recipe adapted from Love Bake Nourish by Amber Rose. In short, I have clearly been missing out in not using polenta or cornmeal more in baking since it is such an interesting ingredient with so many potential uses! As for the elderflower, I am at my parents' in Germany at the moment so had high hopes of maybe finding some here, but a run around my favourite park earlier today confirmed that the season is already over here as well - at least that means it is almost time for ripe elderberries, delicious in their own right! They all sound really interesting, I'm definitely going to have to do some experimenting. I'd never thought of eating elderberries! What do you do with them? lavender shortbread is cool. also love rosemary shortbread because of its woody aroma) i love the way any herb can make something plain-tasting become dimensional in flavour, just a few gramms or even less - and u have a whole different thing ;) that`s pretty amazing. They can be made into a gelee which is commonly eaten with a fresh goat's cheese in Northern Germany. I have also eaten it as a thick syrup poured over fresh cheeses, quark or yoghurt as a simple dessert. I imagine you could bake with the berries just like you would with blueberries. Great idea for a series of posts, I also have loads of recipes on my to do list - this is a great way to get through them. I have never been a fan of that gritty texture but these sound so interesting that I would love to give them a try. Also I loved that first black and white photo with the flowers in the window - beautiful! Emma, what a fun post and a great way to approach recipe discovery. I have to admit, Elderflower and Polenta cookies sound AWESOME and I can see why you wanted to try them. I am such a fan of the flavor of Elderflower. P and I planted a couple of scrubs last year and we can't wait until they produce some flowers for us. I can add this recipe to my list. Hope you're well, my friend. they look like they would be short in texture - wonderfully so! i'm sure i've never baked with polenta - making a batch from scratch once, and stirring non-stop for almost an hourse has kinda put me off polenta! That sounds fascinating, thank you you for the tips! I thought if I had a reason I had to try one I might finally start making them! I'm not always a fan of gritty either - but this was certainly an interesting experiment. So pleased you like the photo. Hi Emma! This is such an intriguing recipe I think I must bookmark & make soon as elderflower is still around up here in Scotland. I use polenta quite a lot for g-f baking, and occasionally us elderflower cordial too (eg elderflower, lemon and courgette cake with oat flour). But the idea of drying them (and how pretty is your cover image!) sounds great. Lovely to meet you at FBC. Hi Kellie! It was lovely to meet you too. Good to know that elderflower is still around up there - do let me know how things go if you try and dry some! as we are now zooming into elderflower season..i may have to try these..i have cornmeal polenta..i guess thats very fine..and also grainy(er) polento..could i blend the two types maybe?? im new to this polenta mularkey! enjoying your blog & FB page..ive just found you..
Hi Tina! Glad you like the blog. I think they'd probably be nicest with the very fine polenta - though a mix with mainly the very fine stuff might be nice (as there's no flour to tone down the crunchiness). I'm no expert on polenta, though!